Dark sea creatures on the cover? Looks like Ichor have returned! Even if they aren’t the only ones in the scene to use such imagery, it is a design that tends to stick with the band. And for good reason as Hadal Ascendency continues the concept from the last two albums of a dark under-the-sea world that is full of battles between humans and creatures of the deep. While the concepts may strike familiarity with fans (in a good way due to story), Ichor haven’t been sitting around since their last output (Depths). The ‘core elements that sat below the surface have completely disappeared at this point in time, as a new level of musical maturity has been reached. There’s still plenty of the usual death metal blast tempo, the band alters the formula a bit and incorporates more atmosphere and depth (pun intended) to each track. Some black metal ashes are spread once in a while, as well as more melancholic emotions pop up to the surface to widen the band’s reach. “In Ecstasy” can rip hard when needed, but some slowdown gives the song a more reflective tone at points and brings in a sense of ‘awe’ factor. Unfortunately, for the bright spots mentioned, there are also a faltering point as well. Some of the mid-tempo riffing the band does just never seems to become quite as compelling as when they blow the doors off with speed or hunker down for a crawl. So you are left with an album that’s entirely enjoyable, but some moments feel like they need just a touch of something special to help them stand out a bit more. 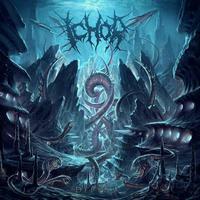 It’s obvious that Ichor are attempting to strengthen their formula and incorporate more diverse elements while being sensitive to their previous releases. While there’s still a little bit left to perfect at this moment, Hadal Ascendency is still a solid record that fans of modern death metal will take to.